Bar Crusher recently teamed up with Navico Australia’s Dave Silva to develop the first 560XS Tournament model. Designed around Dave’s passion for tournament barra fishing in the Top End, this custom model has taken Bar Crusher’s popular ‘crossover’ concept to another level. Built on the heavy-duty plate aluminium 6.10m (LOA) 560 hull, Bar Crusher’s high-tech Waveslicer™ non-pounding, deep-V hull design is perfect for handling the often messy conditions, created through large tidal movement and wind, encountered along the Top End’s river systems and open coastline. The boat’s expertly-engineered Rigideck™ sub-floor system ensures maximum hull strength, while Bar Crusher’s exclusive Quickflow™ water ballast technology turns the boat into an amazingly stable casting platform at rest. Modifying the layout of the standard 560XS Reef Sport, the console has been moved to the starboard side in the 560XS Tournament and the portside pocket has been converted into a sizable rod locker to safely store tackle when it’s not being used. Among other notable features, the huge forward casting platform (with cavernous storage area below) has been covered with 10mm-thick high-density foam and carpeted, providing a cushioned casting surface that will help reduce fatigue during long days on the water. Immediately below the forward casting deck is a carpeted step, which unlocks to reveal a massive plumbed fish well – more than big enough to handle a metre-plus barra. Further casting space has been incorporated aft, with a large, carpeted box providing a decent casting area. This rear casting platform also incorporates three seat spigots, which allows three anglers to sit in comfort during long runs along the coast or up remote river systems. Along with an upgraded power rating to 150hp and 200L fuel tank, the standard in-floor fuel filler has been moved from the centre of the deck to near the side console. The repositioning of the fuel filler is to allow the boat to be fuelled-up even when fully loaded with camping gear and other equipment. The Lowrance HDS (High-Definition System) was the obvious choice for onboard electronics. Dave has a Lowrance HDS-10 mounted on the console, another HDS-10 unit is RAM-mounted in the portside rear corner, while a single HDS-7 is RAM-mounted at the bow near the 24V Minn Kota electric outboard. 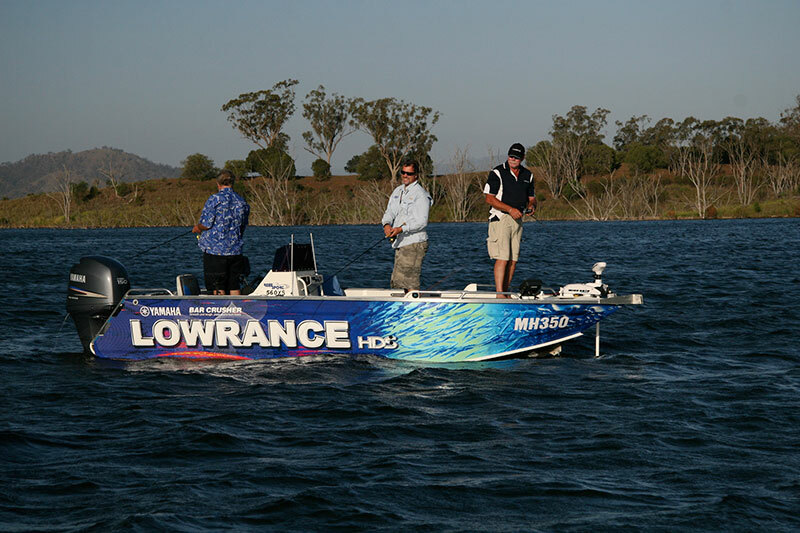 Lowrance’s groundbreaking StructureScan™ has also been incorporated into the system. With all units networked to run off the one transducer, GPS, sonar and engine management information can be viewed on any of the displays located around the boat. As a production plate aluminium boat manufacturer, Bar Crusher may consider adding this ‘one-off’ 560XS Tournament into its range – depending on the level of consumer demand.